This Information Sheet provides information on Topic 5: Using project implementation tools. The project implementation phase gets down to the nitty gritty of executing the project. This is about ensuring that the planned activities are carried out as required in line with the project schedule (on time); according to the budget (in cost); and at the required quality standard. By monitoring and controlling the ‘golden triangle’, along with other aspects (like the project team, communication, etc.) the project manager is working towards ensuring that the project delivers. Thus, managing project performance is essential to achieving the deliverables (objectives and targets). The project manager’s task during the implementation phase is in making sure that remedial actions are taken to address any shortfalls of quality, over expenditure or overruns of time. In implementation you are controlling both the deliverables and performance. The climate change project manager needs to understand that thinking strategically at the beginning of the project will greatly enhance the efficiency and effectiveness of the implementation phase. Let’s look at each factor that needs to be carefully managed during the implementation phase in order to achieve project success. The most well-planned and well-resourced project can struggle or even fail if resourcing issues with project staff happen. This can be because of availability of people, or capacity (ability to perform the tasks required). Conflict within the project team can also result in delays or poor performance. They have members with the skills and experience needed to do the job. Team members can bring experience and approaches from a range of different backgrounds. They have enough people to do the job, but not so many that people get bogged down in communication (seven is an ideal number of people). They have representation from the relevant departments or community stakeholders. For example, a beekeeping project in a particular village simply must include representation from the village to ensure buy-in and support for the project. Remember that when a project is taking place within a community, the utmost respect needs to be paid to what community stakeholders want and need. They must be considered as the most important members of the team, consulted regularly and included in decision making wherever possible. Failure to do so could result in the project being unsuccessful or else plagued by unnecessary conflict. Remember that if the project fails to improve the environment in which they live, or increase income generation possibilities, it is the community that will suffer. When implementing projects, the project manager needs to manage the team – not only what is done when, but also the team relationships, i.e. how people work with each other to achieve the project objectives. Managing project teams about managing performance. This impacts on delivery. Acknowledge the possibility of conflict – The conflict has to be acknowledged before it can be managed and resolved. The tendency is for people to ignore the first signs of conflict, perhaps as it seems trivial, or is difficult to differentiate from the normal, healthy debate that teams can thrive on. If you are concerned about the conflict in your climate change project team, discuss it with other members. Once the team recognises the issue, it can start the process of resolution. Discuss the impact – As a team, discuss the impact conflict will have on team performance and how it can negatively affect the climate change project. Agree to a cooperative process – Everyone involved must agree to cooperate to resolve the conflict. This means putting the team first, and setting aside personal opinions. Be especially careful to resolve conflicts with community members as early as possible. Agree to communicate – The most important thing throughout the resolution process is for everyone to keep communications open. Remember again to consider how the community with whom/ for whom/ in whose area the project is taking place, wants to receive communications. Observe all protocols. Information Sheet 2.2: Defining costs introduced the ‘golden triangle’ of time, cost and quality. These three interlinked concepts are all important in climate change project implementation. Project quality could be impacted on negatively if any factors in a project are not working well. Project quality is about the quality standards and end result of the project. The indicators set for the quality standards are critical to the success of the project. Quality should be the main concern of the climate change project manager. Quality is about meeting the needs and expectations of stakeholders (Riley, 2009). Quality is the on-going process of building and sustaining relationships by assessing, anticipating, and fulfilling stated and implied needs (Quality Digest, 2001). [Quality involves the] management activities and functions involved in determination of quality policy and its implementation through means such as quality planning and quality assurance (including quality control) (Business Dictionary, 2014). From these definitions, you can assume that project quality management is about client / beneficiary satisfaction, prevention over inspection and continuous improvement. One of the definitions above described quality management as a process to reach (and maintain) a level of excellence. In order to achieve this, quality must be planned, assessed, controlled and validated (confirmed). These words summarise the quality management process. Quality has a lot to do with how the client (the funder) and the beneficiary (from the community) perceive the project. Does the funder think the money was wisely used and the intervention has had the desired impact, and is there evidence of this? (Refer to the RVCC M&E Framework for more details.) Does the community/ beneficiaries see a change in the quality of the landscape/ fertility of the soil/ crop yields, or an improvement in income levels or employment opportunities as a result of the project? Quality has a strong human element to it! Some project risks can be anticipated and planned for during the preparation phase, however, as the project is implemented, you will become aware of more events that pose a threat to project success. The likelihood and consequences of certain risks may also change as the project moves forward. This is why it is important to keep track of risks on an ongoing basis during project implementation. In project implementation, it is important that you constantly monitor risks. Typically, the project manager will use the risk management plan. However, as the project is implemented, new risks are identified and will need to be managed. These must be documented and a plan put in place. A Risk Management Log is a document that allows the project manager and team to identify new risks as they arise, track the status of risks as the project progresses, and develop strategies and contingency plans to deal with the risks. This document should be reviewed and updated frequently, for example, at each project meeting with the project team’s input. There are two methods that project managers can use to manage costs, namely Variance Analysis and Earned Value. Variance analysis is an essential part of the budget management process. Variance analysis is a comparison between budgeted and actual expenditure. As a result of unforeseen factors, some budget items are under-spent and some over-spent. Variance analysis enables climate change project managers to monitor their budgets on a monthly or quarterly basis and take early corrective action, if necessary. Your project needs to run according to a budget. This is the source document, and you will compare ‘actual’ against ‘budgeted’ income and expenditure. We will now look at how to use variances to manage expenditure. If the answer to this question is ‘YES’, then the reason for saving could be that you delivered a service or product of poor quality or that you had an inaccurate project plan and the costs were over-budgeted for. If the answer to the question is ‘NO’, then the saving could be because of non-delivery of a service or product or event. If the answer to this question is ‘YES’ then the reason for the over-expenditure could be that you delivered more than you intended to, or the costs exceeded the amount budgeted for. If the answer to this question is ‘NO’, then the over-expenditure could be because of poor budget planning. Variance reporting is part of the project reporting that should be done monthly, quarterly, half yearly and annually. Another way of managing project costs, is Earned Value. It is slightly more complex than variance analysis, but provides the project manager (and stakeholders) with a more accurate picture of project expenditure by the end of the project. … a systematic project management process used to find variances in projects based on the comparison of work performed and work planned. EVM is used on the cost and schedule control and can be very useful in project forecasting. The project baseline is an essential component of EVM and serves as a reference point for all EVM related activities. EVM provides quantitative data for project decision making. EVM allows the project manager to measure performance objectively and predict future outcomes. If the project is behind schedule, the project manager needs to engage in problem solving to prevent further delays. Procurement – ensure that the correct types and quantities of resources are secured at the right cost (within budget). Remember to check that equipment can produce quality outputs. Delivery – ensure that resources are delivered where they are needed in the right quantities, at the right time (when needed). This will prevent delays. Maintenance – ensure that assets are maintained and kept in good working order to avoid damage and prevent delays due to downtime. A maintenance schedule should be developed for expensive equipment that is critical to performing project activities and that will be used for the duration of the project. In implementing projects, it is important to manage time (as projects have a limited duration) and to report on how the project is performing against the planned schedule (Gantt chart). Project managers can track progress in projects – planned versus actual – using the Gantt chart. This allows the project manager to identify activities that are going off schedule and take remedial action to bring the project back on track. There are two methods a project manager uses if projects are falling behind schedule – fast tracking and crashing. Let’s look at these now. Fast tracking Activities that were planned to be sequential (one after the other) are undertaken in parallel (at the same time). May pose a risk if not managed and controlled carefully. If errors arise, parts of the project may need to be re-done. May not always be possible in a climate change project which may be, by nature, sequential. Crashing Resources are added to the project. But a trade- off analysis is necessary to determine the lowest additional cost. May be expensive as more resources are pulled into the project. This may result in the project going over budget. Projects require ongoing communication and the documentation of both delivery and performance. The project manager needs to ensure that accurate records are kept. This record keeping needs to align to organisational (and donor/funder) requirements. It produces means of verification of indicators and targets that are required as part of the RVCC Integrated Monitoring and Evaluation System. Let’s look at three types of records that are essential in projects, namely project change requests, meeting minutes and reports. These are all formal records of what is happening in the project – in terms of deliverables and performance. 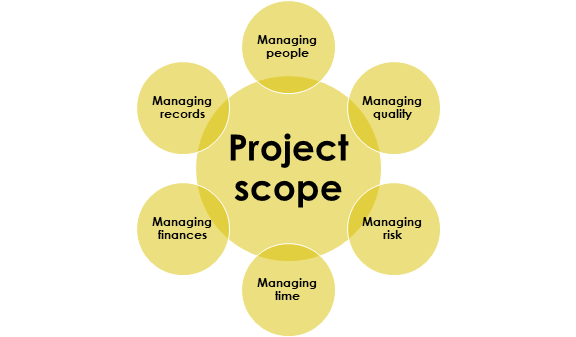 One of the most common risks faced by any project manager is the risk of project scope creep. This happens when the funder, or the community, or a senior manager, asks for further tasks to be added to the project schedule. Such requests can compromise project delivery, strain resources (materials, equipment and people) and cause stress. Unless there is a negotiated, agreed and signed addendum to the project contract, the project manager needs to resist such requests. A scope change request is permissible and achievable if one task is substituted for another of equal effort and cost. But it is critically important that the request is in writing, the reasons and clear motivation are provided, budget line item substitutions are provided, and the senior person authorises the change request in writing and with a signature. Be very careful about what constitutes ‘proof’ of permission: a voice message may not be sufficient, neither an SMS. Also clarify whether or not an email is sufficiently authoritative. Minutes and emails should be stored in a central folder so that team members can access these easily. While being so particular about keeping records of notes, discussions and conversations may seem troublesome, such records could help to resolve disputes if these arise. Reports are an essential monitoring tool for climate change project managers. They are not only necessary for project close-out purposes. At the start of the project, it should be determined what reports are required, in what format and the frequency of reporting. Developing a habit of good, succinct, and clear reporting not only helps you as the project manager to keep control of the project, but also makes your job easier as you will more easily spot trends, blockages and problems, and be able to plan remedial action. Whether your reports have a problem solving orientation – so what is going to be done to address/ mitigate problems that you have discerned? Ebbesen, J.B., Hope, A.J. 2013. Re-imagining the Iron triangle: embedding sustainability into project constraints. PM World Journal. II (III) pp. 1-13. OfficeApps.live.com, n.d. CDC_UP_Risk_Management_Log_Template. [Online] Available at: https://view.officeapps.live.com/op/view.aspx?src=https://www2a.cdc.gov/cdcup/library/templates/CDC_UP_Risk_Management_Log_Template.xls. Roberts, Alexander & Wallace, William. 2004. Project Management. Edinburgh: Edinburgh Business School. Crash analysis A crash analysis assumes that the quality on a project remains constant, and that time and cost need to be adjusted. Deliverables Tangible items / products that are produced by the project team in accordance with customer requirements during and at the completion of the performance of the project. Expenditure The money spent in order to deliver the climate change adaptation interventions. GANTT chart A Gantt chart (named after the creator Henry Laurence Gantt) is a tool commonly used in project management to show the duration of tasks in a project, measured against real time. Income The funding / money coming in. Indicator A quantitative or qualitative variable (factor) that provides a reliable and valid measurement of achievement or reflects performance or changes from the current state. Objectives What is to be accomplished and the benefits achieved from implementing an intervention; the tangible end product that the project team must produce and deliver. Project implementation Project implementation is about doing or executing. The project manager responds to project events as the project is implemented. Project schedule The project schedule is about planning what needs to happen in the project. The project schedule ‘models reality, it is not reality’. It changes as events happen in the project. Risk An uncertain event or condition in a project, that if it comes about, will affect one or more project objective. Scope All the work that must be done to produce all the project deliverables that meet the customer requirements and acceptance criteria and accomplish the project objective. Trade off analysis A trade off analysis considers the relationship between project performance and time, or project performance and cost.